David J. Goodwin is a librarian, urbanist, blogger, and author. 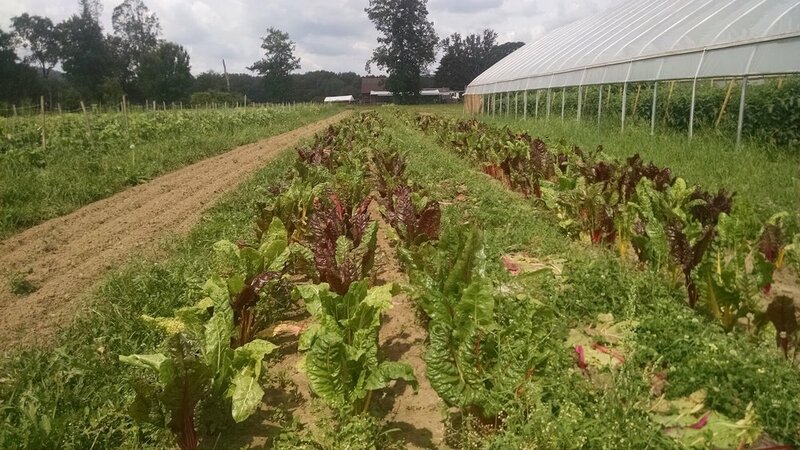 Today, he's sharing a guest article about a local farm in his hometown region as part of our ongoing conversation about local food and its relationship to strong towns. Along a quiet stretch of the Allegheny River in Western New York—a region buffeted by decades of job and population loss—a small, organic farm strives to change how the surrounding community feeds itself and defines its relationship with food and the earth. From the road, the farm appears to be a modest, tidy, yet unassuming operation. Several rows of high-tunnel greenhouses run parallel to the property’s roadside gate. A small cluster of sheds and outbuildings are located near the farm’s entrance. Crops and fallow fields sit further in the distance. Rolling, verdant hills overlook the entire valley. A sign reading “Canticle Farm” sets the property apart from the other homesteads dotting the landscape. Motivated by strong social justice teachings and traditions, the Franciscan Sisters of Allegany, a congregation of Catholic nuns, proposed establishing a mission “committed to connect all peoples, to practice Earth friendly habits, and to come to a realization of a Creation-centered spirituality” in the late 1990s. Farming would be the vehicle or vessel through which the order would accomplish this new ministry. In 2000, the Sisters bought a twenty-two-acre property, originally owned by nearby St. Bonaventure University, and began clearing the land. Located on the Allegheny River floodplain, the soil was rich and silty, perfect for agriculture. Area farmers, Cornell Cooperative Extension, and other interested parties helped with technical assistance, strategic planning, and plain grunt work. Within its first year, Canticle Farm reclaimed two acres for cultivation. Presently, this number has expanded to seven acres. Today, kale, kohlrabi, greens, and squash grow beneath the open sky. Tomatoes, cucumbers, peppers, and eggplants flourish in the greenhouses. Vegetables of different shapes, colors, and varieties expose customers to new food choices, expand their palates, and challenge their notions of cooking and healthy eating. Canticle Farm is fully organic, from the seeds planted in the spring to the produce harvested for local markets. The past decade or so has witnessed a new interest in food in America. The documentary Food, Inc. and Michael Pollan’s writings popularized the ethos of this emerging philosophy and practice. Farmers markets, community-supported agriculture (CSA), farm-to-table restaurants, and local beverage and food producers are now viewed as viable businesses and as tools to kick-start local economic growth. Households tend kitchen gardens. Books on canning, fermentation, and other methods of food preservation crowd bookstore shelves. Meanwhile, more Americans voice concern over the origin of their food, preferring locally-sourced produce, meat, and dairy uncontaminated by chemicals and genetic tinkering. Canticle Farm belongs to this burgeoning culture. However, Canticle Farm provides its customers with much more than healthy, nutritious, and local food (admittedly, that would be enough). While filling their boxes at the weekly CSA pick-up or inspecting vegetables at the market, people participate in a community. Strangers swap recipes or point out the benefits of certain vegetables. The Farm offers yoga classes, family storytime, and potluck dinners. Every fall, the Farm hosts a farm-to-table dinner with a multi-course meal, locally-made beer and wine, tours, music, and an evening bonfire. By every metric, Americans are increasingly isolated, finding substitutes for companionship in cable television, social media, and the Internet. Canticle Farm offers an alternative to this paradigm. This experiment in building and strengthening social capital extends beyond connecting individual customers. Clients of the ReHabilitation Center, a non-profit assisting disabled individuals and their families, harvest crops throughout the growing season. Twenty-percent of the Farm’s CSAs are sponsored and donated to area food pantries, hot meals programs, and shelters. This food reaches the most vulnerable in the region: the addicted, the abandoned, and the homeless. Farm staff recently instructed shelter residents on building and utilizing vertical gardening units. Now, these same residents grow their own food. At first glance, maintaining a vertical garden might seem to be simple, almost pedestrian. However, this small responsibility contains real power. Men and women on the margins of society and coping with problems like domestic violence, mental illness, and substance abuse, are tasked with nurturing the house garden and providing food for themselves and their fellow residents. Such a small act potentially allows people to build a sense of self-worth, empowerment, and independence. This emotional growth might allow residents to take control of aspects of their lives and to break cycles of poverty, addiction, and abuse. Western New York is home to several Seneca Nation of Indians reservations. Representatives of the Allegany Indian Reservation contacted Canticle Farm for guidance in cultivating crops for food and traditional rituals. Now, the farm manager is overseeing the construction of greenhouses and teaching best growing practices on the reservation. Again, this small act might allow members of the Seneca Nation to embrace and pass down native traditions and even to generate interest in such practices among the region’s non-native people. On an institutional level, Canticle Farm’s outreach builds relationships with local and regional non-profits. Such networks might encourage Canticle Farm and its partners to identify and prioritize crucial challenges and needs. A concerted effort by the various groups could draw attention to food insecurity--or any issue--and press government officials and institutions for funds and resources. Canticle Farm reveals disadvantages faced by small, locally-focused agricultural producers. Obtaining official organic certification requires significant administrative, legal, and financial resources. Large and corporate farms can more easily absorb these costs. Like many small businesses, Canticle Farm does not possess such capabilities and, thus, decided not to pursue government certification. Additionally, federal subsidies and policy obfuscate the true cost of food. Many new customers scratch their heads and wonder why a pint of tomatoes costs twice as that shipped from California and stocked at Walmart. For all the value placed upon the family farm and small business in American identity, the federal government strongly favors and supports industrial agriculture over local food systems. Canticle Farm demonstrates how the local food movement in its many mediums—neighborhood farmers markets, CSAs, farm-to-table restaurants, and small farms—challenges people and communities to rethink food and its impact on their lives. Food can provide individuals with substance and delight. Food can contribute to the local economy and civic infrastructure. Food can help repair frayed social and communal bonds. To build healthy, resilient towns and cities, food must matter. Interested in learning more about this topic? Join us September 12 at 12pm CST for a live webcast with a leader from another small-scale farm in Ferguson, MO. Get more information here. David J. Goodwin is a librarian, urbanist, blogger, and author. His book, Left Bank of the Hudson: Jersey City and the Artists of 111 1st Street, will be published by Fordham University Press in October 2017. You can follow Goodwin at: www.anothertowonthehudson.com and @DavidJHudsonJC.